warning: Invalid argument supplied for foreach() in D:\www\at2015\includes\common.inc(1695) : eval()'d code on line 547. 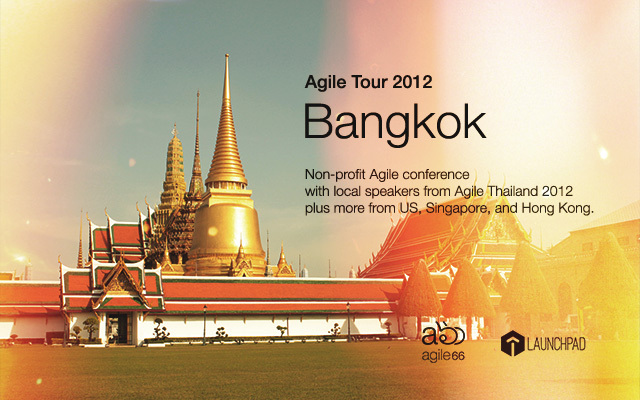 Agile66, a community of Agile enthusiasts in Thailand is organizing Agile Tour Bangkok 2012 conference as part of global Agile Tour non-profit conference hosted in 84 cities of 29 countries around the world during October to December this year. The main objective is to promote Agile, the proven software development practices to turnaround software development project from notorious death march to successful deliverables and joyful project, to Thai community. Speakers at the conference are mainly from the local community plus additional Agile experts from oversea. a phrase from the Agile Manifesto which, in other word, means the theme is about promoting agile to wider audience. Want to sponsor the conference? Read here. Q1: งานเริ่ม กี่โมง ถึงกี่โมง มี ตาราง schedule มั้ย? Y8a     a8P   Y8a     a8P       88   d8"